Everyone's eyes are on a royal couple, but there is more behind the scenes than they'll ever know. Lady Nell Daughtry is certain her sister will be a perfect princess, if only she gets the reluctant bride safely to the church to marry Prince Frederick of Lautenberg. But what she doesn't know is that, in the wedding party, she's been paired with her former fiancee, Robert Knightly … and now she'll be face-to-face with the man who walked away. When Nell accompanies her sister to meet her fiancee, she never dreamed that she would run into the man that broke her heart. Nell must turn to Robert to keep her sisters family problem a secret. In revealing the family problem, Nell finds out that she pulled away from Robert causing him to walk away all those years ago. The couple find out they still have feelings for each other, and that by helping the royal couple they are helping themselves. 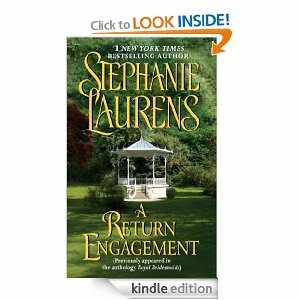 This was a wonderful book by Ms. Laurens. It is a historical romance that is well written and a must read for those that believe in happily ever after.